Dengue virus (DENV), zika virus (ZIKV), chikungunya virus (CHIKV), and yellow fever virus (YFV) share many common clinical features, making it difficult to distinguish between them. However, the treatments for the diseases caused by these viruses are substantially different. Therefore, early diagnosis is the key for successful clinical management and control of epidemics. At GenBody Inc., we aim to develop sensitive and specific assays for the diagnosis of DENV, ZIKV, CHIKV, and YFV infection. A DENV IgG/IgM Ab rapid diagnostic test (RDT) was developed, wherein dengue viruses were cultured in animal cells and were used as antigens to retain the native viral coat protein. Monoclonal antibodies (mAbs) were then developed against domain I of envelope glycoprotein (EDI). A clinical evaluation proved that the new RDT is more effective in detecting anti-dengue antibodies than two major commercial tests. A highly accurate dengue NS1 rapid test was developed using anti-DENV NS1 mAbs generated against the DENV NS1 protein with high affinity. Clinical evaluation shows that the test detects 4 dengue serotypes with improved diagnostic performance. The RDT kit for detecting IgG/IgM antibodies against ZIKV was developed using monoclonal antibodies to the envelope (E) and non-structural protein 1 (NS1) of ZIKV. These proteins were produced using baculovirus expression vector with Sf9 cells. To develop and evaluate CHIKV-specific IgM detection test, baculoviruses carrying E1 envelope protein genes of CHIKV were generated. The sero-reactivity of recombinant CHIKV E proteins were determined using residual blood, collected from CHIKV-confirmed patients. The CHIK IgM test was strongly reactive toward anti-CHIKV IgM and showed almost no cross-reactivity with anti-Dengue and flavivirus antibodies. We also developed a highly accurate YFV NS1 rapid test using two mouse monoclonal antibodies against native YFV NS1. The detection limits of the IC test were ≥0.16 × 101 PFU/ml and 0.8 ng/ml. No cross reactivity was shown with other flaviviruses such as DENV and ZIKV as well as with an alphavirus such as CHIKV and MAYV. The 4 RDTs developed in this study were very sensitive and highly specific. Upon validation, these RDTs would serve as a method of choice for point-of-care diagnosis and large-scale surveys of viral infection under clinical or field conditions in endemic areas worldwide. Chong Chom-Kyu earned his PhD in Chemistry from Chungbuk National University in 2000. Prior to founding Genbody Inc. in 2012, he had more than 10 years working on the development of IVD kits at various companies, including Asan Pharmaceutical Co. Ltd. and SK Bioland Co. Ltd. 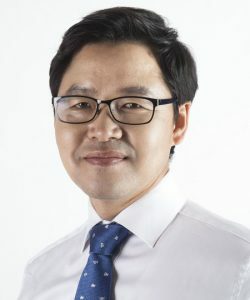 He was also an Assistant Professor at Biochemistry Department, Chungbuk National University from 2009 to 2011. In the last 10 years, Dr. Chong co-authored over 30 publications in peer-reviewed journals and several patents. Information: ORCID (active), Researchgate (not active).